On this day 15 (!) years ago, my beloved Dad escaped the suffering of lymphoma and left the boundaries of this earth to enter heaven’s gates – to touch the face of God, and to return the embrace of the Lord Whom Dad served his entire life. My Sewing Saturday was very sentimental, reflecting on this day 15 years ago. It’s amazing how raw the feelings can be, still, and I shed tears more than once today. The shirt Dad is holding up in the opening picture is one of many I made for him. My Mom said it was one of his favorites and it’s the one he was buried in. 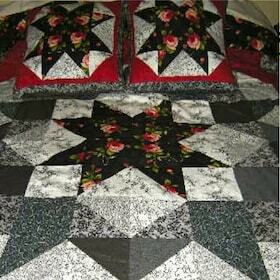 On a happier note, I was able to complete and ship out THIS quilt today! Here it is, front and back. This is the matching pillow. My fourth granddaughter, Shara Nicole! Are you doing anything special this Labor Day weekend?